The Samsung Galaxy A50 is a class act, there's no getting away from it, at the price-point it's a mid-ranger pretending so very hard to be a flagship. Last month I was reviewing the Moto G7 Plus which is, give or take, around the same price as this and I thought it would be a fair starting point to put them up against each other here. Before we even start to consider the UX, we can see from the specs that the Moto leads in some areas but the A50 outguns it in many others. My review of the Moto G7 Plus can be read in conjunction, where I drilled down a little further. You can also see Steve Litchfield's video review of that unit in The Phones Show 362. Comparing the two demonstrates that Samsung have come down from their flagships in some respects, whereas Moto, if you consider the Z-series to be their flagships, have merely chipped away at the edges, adding some features, taking some away, but more likely evolving the G-series range. So it feels like Moto are stepping up and Samsung down, meeting somewhere in the middle. There's no particular reason, incidentally, why I am putting these two up against each other apart from mid-range price-point and the convenience of having them to hand recently. It could easily have been many others. Plastic is where build compromise has been made in some respects for both and whilst for the Moto that only means around the rim, retaining glass on front and back, for Samsung the only glass left is on the front. The back, they're calling Glasstic(!) as they think that it looks much like glass but has the benefits of plastic. It's slippery, but nothing like glass would be. It's light-catching shimmery-shiney, as is the trend. The plastic of course makes for lighter phones and this is the case for both. Maybe that makes it easier for environment-proofing. The A50 feels light in the hand - no reassuring weight here. Though the Moto in reality is only 10g heavier, it feels more. The Moto has its own internal arrangements making it 'splashproof' whereas the A50 is officially rated IP6/8 for water/dust. Looking at the front, the two devices are near identical in size, Gorilla Glass 3 (a much better compromise of scratch resistance over shatter than 5) protected screens go right out to left/right and both have a small chin. The Moto is a bit fatter, but backs curve round to edges - and sides are thinner on both - phones are getting boringly the same these days. Paths divide here with screens as Samsung put their own Super AMOLED (tall) screen in place whilst Moto opt for LCD. We all know the pros and cons of the two by now, so can only look, see and compare with our eyes. The 1080p 6.4" 401ppi screen of the A50 is, as you'd expect, super-bright with gorgeous colours, user-adjustable. The LCD of the Moto, perfectly good enough for most uses apart from direct sun - but really not in the same league. The place I noticed this most was the Always on Display and brightness thereof. There's a teardrop notch around the camera, same as the Moto, but in this case you can 'hide front camera' thereby shifting the content down a line and losing the ears, unlike the Moto. To be honest, these teardrops are so small, I don't feel the need to get shot of 'em now anyway. Very annoyingly there's no TPU in the A50 box, but a box inside which clearly should have one in - and reports from other users that there was one included. Shoddy. I know that I always get a better one anyway, but on this occasion I couldn't quickly enough, so the phone is slipping around. Having said that, the plastic back of the A50 makes it nowhere near as slippery as the Moto's glass, so it could be used without a case. I'd not recommend it still. Apart from anything else, the plastic back is smothered in fingerprints in seconds! The buttons on the side of the A50 are decent enough, plastic, thin - not a patch on the more expensive Samsungs' but they're perfectly functional and seem firm enough to the touch. On the left is a microSD Card/Dual-SIM slot giving the user the choice to use all three and assign data to which SIM Card they fancy, but not both. The microSD Card slot read my 512GB card no bother and appears to read/write to it with ease. This is of course a 128GB model, significantly better - well twice as good actually(!) - as the 64GB of the Moto. I know there's a card slot on both, but being able to hold that much more internally makes digital management much easier - for me at least. Wifi and cellular aerials seem to do a good job and NFC is present in this UK model with options to use the phone for payments and other supported connectivity tasks. The bottom of the phone houses a single speaker and 3.5mm audio-out socket flanking a USB-C port for charging and data. Unlike the big brothers, there doesn't appear to be any USB-HDMI-Out functionality, nor DeX of course, which is a shame for those of us who want to output to a TV, but there is USB-OTG. There's no Qi charging here but the unit is supplied with a big battery which I'll come back to soon. On the back there's three camera lenses in a very slightly protruding island, sitting above an LED flash. That's it really for the physical tour! Let's start again with my favourite topic - speakers! Or in this case, speaker. Singular. It's a mono bottom-firing speaker, compared to the faux stereo setup of the Moto. It's a loud enough speaker for most purposes and has a basic equaliser system-wide. There's a tease of Dolby Atmos via settings, but actually it only works with stuff plugged into the audio-out socket, not built-in speaker, which is a shame. Plug in a pair of headphones and the Dolby Atmos becomes available, but it's only the dumbed-down version present on the Note9 and S9, not the full tweakable one supplied with the Razer Phone. So you get Auto, Movie, Music or Voice. There are some differences between them but, as always, how that all sounds depends very much on what you're listening to, how it's encoded and so on. Some find it best when it's off. Nothing's simple! There is a set of very basic equalisation options for the speaker output, but it's not Dolby. Just the usual Pop, Rock, Classic, Jazz and Custom thing, which really doesn't do much. Any 'improvements' are clearly at the expense of volume. The winner here is the Moto, for sure - check my review, linked to above. The sound coming from the flagship Samsung phones has certainly not been emulated here on the A50. It's perfectly good for listening to voice and music for most people, just nothing special or better than many phones out there. The emphasis is focused on the higher frequencies which, at full volume tend towards tinny. Drop the volume down to 75% and some of the depth drops in and a much more preferable sound is created. Interesting how Moto have obviously prioritised sound whereas Samsung have considered other attributes more important. Testing the speaker against other available phones here, I discovered that the Nokia 8 and 8 Sirocco have a better quality and richness at full volume than the A50 but the A50 is just about louder - not by much. The A50 somehow feels 'hollow' as a sound though. I'm not sure if you'll understand what I mean, but however I tried to play with settings, against the Nokia's, I can't think of a better word. Hollow. The Nokia sound is much nicer to listen to. Against the Razer it didn't stand a chance of course, as I said above, it's significantly behind the Moto G7 Plus so what I have left in a similar league is the Moto Z3 Play. Testing with just the phones' speaker of course, not with JBL SoundBoost Mod attached! The result is that I think Moto have better components than Samsung have afforded the A50. The volume output is similar but the Z3 Play is oodles nicer to listen to. Whilst the A50 focuses on the high-end frequencies, the Moto goes for mid/lower, producing a much nicer, balanced and rich sound. I was wincing when the A50 hit some high notes, especially when loud. But let's be clear - I'm giving the A50 a poor score here against what else I have, but for Joe Public it will be absolutely fine - certainly loud - particularly if he listens to sounds for which higher frequencies are considered advantageous. Using my test headphones the sound is super. Joe, again, couldn't complain about the output for private listening - unlike the bundled horrible-looking in-ear plugs, which he might - and I'll leave unopened for the next owner of this phone to suffer! Good volume, rich bass and excellent stereo separation, as you might expect - as it was with the Moto. I do find it quite hard to fault the average phone's audio-output with good headphones, but then I'm no audiophile. Your mileage may vary if you are! Bluetooth is present though sans aptX. It hooked up perfectly well for me with headphones and hifi equipment and did what it was told without incident. The battery is a 4000mAh unit so significantly better than the Moto's and how they have fitted that into a body as thin as this, I don't know. Kudos to Samsung for achieving this, though for me personally, I'd be happier for more thickness and even more, like with their own 5000mAh from the A9/Pro models previously. There's 15W fast-charging with a plug in the box, but nothing like the supplied 27W version supplied for Moto users. The battery with more capacity claws back that Moto advantage though of course, as you'll need to do it less often! On testing over 4 days, I can report that the battery life is as excellent as the other phones I have with similar sizes - the Razer Phone/Razer Phone 2, Nokia 7 Plus et al - we're looking at 30hrs off charge using adaptive battery/brightness and c.8hrs SoT. This is how all phone batteries should behave! There's a range of biometrics available for the A50 user - in fact most of what's available in the Note9 with an addition - the under-glass fingerprint scanner - but less the Iris Detection. The fingerprint scanner is an optical one, so not ultrasonic, which is still questionable and in early stages. It's like the one which the OnePlus 6T has - and it's slow. Slow to register, only seems to allow 3 fingers to be registered (why?) and slow to use as a way-in. However, it does work - and works very reliably. It's not fussy about angles and directions, which we're hearing about elsewhere. This, matched up with the face recognition, lift-to-wake, double-tap-to-wake, keep-screen-on-when-looking and all the other fancy stuff does seem to take things up a notch from the Moto's simple, but fast and clean rear-mounted capacitive fingerprint scanner. Hot topic, I know, but I think it depends on how you're using your device mostly. If your phone lives in your pocket a lot, then there's nothing wrong with the Moto method as you pull it out and fire it up. I tend to want access on a desk more, which is why some sort of front-activation suits me better - or the Motorola AoD interactivity. But each to their own. On initial testing, the face recognition is not as good and reliable as the Note9's version. Maybe that's to do with quality of components including the selfie camera. Under the hood, we have 4GB RAM (on this 128GB UK model) and an Exynos 9610 steering the ship which, say those who seem to know, equates with a Snapdragon 660 - so think Nokia 7 Plus. The latter didn't really slow down for me in the time I had it. It wasn't the fastest out of the block starting up nor was it completely free of the odd nano-second wait here and there. 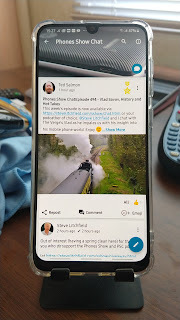 This A50 is running an awful lot more Samsung software and (they hope) services in the background over a pure AndroidOne Nokia, and I think it shows. I'm not usually one to nit-pick with processes and speed around the UI, as I'm not a gamer and my demands are usually pretty average, but there is certainly a bit of lag, just here and there, screen-taps needing doing a second time sometimes, often when I tap Settings, I get a Settings Icon in the middle of the screen then the Settings UI maybe half a second later. Next time in though, it's instant. This makes me think that it probably is the software mixed with this chipset - and users could really do with that 6GB RAM version that's out there somewhere. Don't get me wrong - it's not a deal breaker or the end of the world. It's just now and then - and most of the time when up and running it's not noticeable. I guess coming from the flying Note9 using the same One UI (which I'll come to) gave me an example of how Samsung can make a demanding bunch of software run silkily with higher-end hardware. Comparing this with the Moto G7 Plus, which is pretty near to pure Android, just a few Moto bolt-ons to power and run, it's a smoother experience in Motoland and I saw none of that lag anywhere. Yes, to the software. Well, they've skimped here and there compared to the Note9, which I guess is inevitable to try and cut the cost even more - or even to just ensure that flagships remain flagships and they can charge loads more! Little things like the aforementioned Dolby Atmos which is hard to imagine would really cost much more to make the same as the Note9's implementation (maybe that's to do with there being no stereo). Iris scanner missing, as I said. No way to control the Always On Display's brightness as there is on the Note9. A few things along the way. But again, let's not get picky. The very same Android 9 is present with March 2019 Google Security and Samsung's One UI. Most of the goodness is scattered across that, along with all the Pie enhancements, enabling the user to not only enjoy a dark-themed UI but also enjoy all sorts of control, bells and whistles. Since my Note9 Review, we've covered much about One UI in PSC - much of it is very similar, if not identical. It's a much improved interface and has been met with near-universal applause and appreciation. I won't plough through it all again here, but just mention one aspect that I didn't before - fonts. Being able to change fonts in settings for system-wide execution is great. There's a font called SamsungOne which is just lovely - and an option to Bold it too. Nice touches left, right and centre for the selective Samsung user. There's no Bixby button and the software can, in a way that was more difficult on the Note9, be ignored - almost completely if you ignore the top-left in-camera! There doesn't seem to be the same level of nagging going on to use Samsung services across the board. With the Note9, I never really got away from that - even when I said NO to all Samsung stuff at every opportunity - it still popped up suggestions and reminders. It doesn't seem to do that here, so I'm really not sure why. I said NO to everything from the outset and it's leaving me in peace! It's a much cleaner experience in that respect and loaded up with Nova Prime, you can almost forget that it's a Samsung - except where you want to make the most of any features you fancy using (or you catch sight of the pre-installed Facebook and LinkedIn. Grrrr.) Perhaps they genuinely feel that flagship owners will actually want to live in SamsungLand and not Google's. Odd. But I'm not complaining - that makes it, for me, a much, much better software experience than that on the expensive Samsung models. I was delighted to know that the camera cluster included a 123-degree (proper) wide-angle lens. A wonderful feature that makes me want to take photos so much more. The LG paved the way in this respect for me as I remember being pretty wow'd by the G6 and couldn't stop snapping! It produces excellent interior shots of course and fabulous landscapes without a Panorama mode. It's one of three cameras on the back and this is where the purist camera-in-phone convergence crowd will get off the bus! The photographs taken with this phone are perfectly good enough for almost all of the people who are likely to buy/use this phone. It's really only pixel-peepers who will declare that this phone is useless for them because it's not as perfect as some Nokia from 5/10 years ago which, in turn was nowhere near as good as proper cameras with proper glass. These cameras are just fine for the rest of us. Really. The main camera is a 25MP f1.7 AF unit, assisted by the 8MP (non AF) f2.2 wide-angle I mentioned and a 5MP f2.2 depth-sensor. There's no OIS present, which is where, should you not be wow'd by the wide-angle facility, the Moto G7 Plus is ahead. There's no night-mode or assistance in any way for shots people want to take in dark situations, unlike the Moto which does very well in the darkness and of course, the all-singing Note9 et al. Cut down for the price-point. There's a 25MP f2 Selfie camera around the other side which, along with the whole camera software interface, provides for Samsung's Ai - particularly for selfies, helping with shallow DoF shots. And for this, it seems to do well. The camera software is very similar to the Samsung flagships' versions with some bits and pieces missing for some bizarre reason - like no manual focus control in the Pro Mode. Did they need to remove that? Maybe it's about target audience rather than price-point. Not confusing those who won't want to see or use those kind of options. But there's loads to play with in there - including this Ai stuff, which really does do very well for most people, most of the time. The wide-angle makes this a winner for me over the OIS of the Moto G7 Play! My verdict is that this is a very, very impressive phone for the money. Anybody wanting a top-notch Android experience should certainly have this on their shortlist. It has many of the features of the stable's flagships, outshines the competition in many areas, is cleaner and closer to Vanilla in many ways than many other Samsung models and is not plagued by Bixby or other Samsung software and services too aggressively. There's 128GB of storage here and microSD expansion, there's a perfectly good camera setup with a wide-angle killer-feature, speakers which are perfectly good again for most people, a stonking battery performance, a gorgeous screen - what's not to like, you have to ask. I'm very impressed - more impressed, somehow, than I was with the Note9. Now there's a conundrum! If I had to choose between the Moto G7 Plus and this, I'd have to go with the Moto - but then I have a disproportionate weighting on speakers, purer software and AoD arrangements. If you were similarly biased with cameras (and not bothered about the wide-angle), you might do likewise because of the OIS. But there's a huge amount of benefit to be had by laying those factors aside and soaking up the terrific capability of this Samsung Galaxy A50. If buying, I might be tempted to seek out the 6GB RAM version to just pep it up a little but even this one, at around £300 new in the UK in April 2019 is highly recommended. 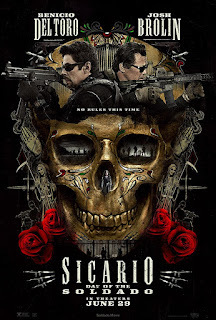 I really enjoyed the first Sicario film, largely for the super-cool Benicio del Toro who really doesn't have to do much acting to make me smile! In actual fact, here, like in the original, he does - and does so very convincingly. We're back in South America and the American agencies are engaging those who 'do the dirty work' with no traces, no comebacks, in order to keep the American public safer from terrorism from the other side of the world - in this case, routing those who are willing via the African coast on boats, into Mexico and up. Our hero is given pretty much a James Bond style free ticket to do what he needs to do in order to achieve the goals. A complex plan is put into action, teaming up Alejandro with Matt, played by Josh Brolin again, though taking less of a lead than he did in the last outing. He did get involved in some of the action, but he played more of a 'manager' role than Del Toro, our all-action hero! The complex plan included trying to create a war between rival Cartels in Mexico in order to put a spoke in the human trafficking chain and stop people from Africa being swept across the Mexico/American border and thus terrorise Americans. This plan involved the kidnapping of one of the top criminals' daughters, Isabel, played very well indeed by the young Isabela Moner. She didn't have a huge amount of lines to learn but coming from the cocky schoolgirl who knew nobody could touch her because of her dad, to expressing new anxiety, fear and disbelief at the situation in which she found herself, was a different challenge. I think she did very well and will look forward to seeing her career develop. Back to the plot and of course, it all goes wrong, Alejandro and Isabel get separated from the task force and have to make it across hostile territory and back to base, posing as not quite who they are, to get across the border like the other migrants. 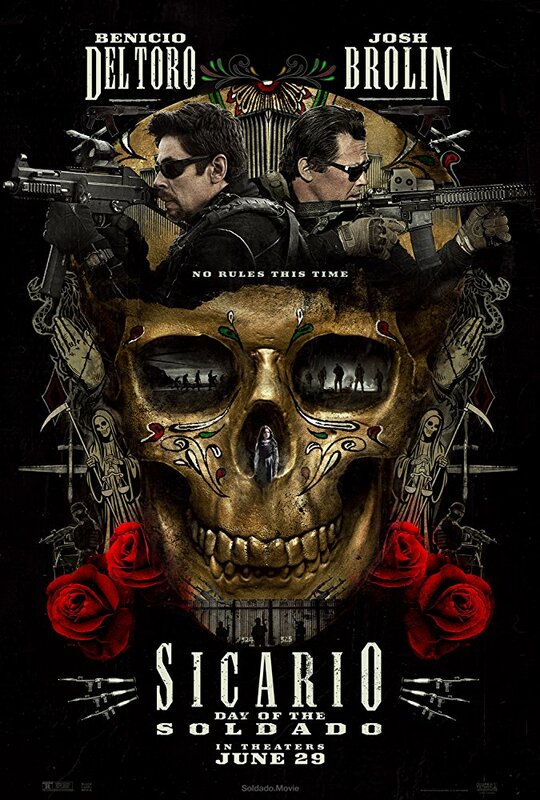 Throw into the mix a young American lad who desperately wants to join his cousin across the border and make a fortune as a part of the Cartel action and we have another angle - and sub-plot about recruitment, ambition and the Mexico/US border. There's some violence and blood as you'd expect, but nothing really gory reflecting maybe what we read about how people in power can treat other humans in situations like this. There's greater impact - and sympathy from the viewer - about the sad trafficking trade and how that dehumanises people. It's a nicely paced and constructed story, again from the pen of actor/writer/director/producer Taylor Sheridan, keeping the action and adventure flowing whilst not alienating the audience with the twists, turns, politics and complex plot-line - though you need to be on your toes! The (different from the first film) director Stefano Sollima keeps things tight, the Mexican landscape often makes interesting visuals a given, but more work has gone into some of the action sequences - like the dramatic shots of helicopters in action. There's plenty of dark interior scenes, which are handled well and all elements come together to keep tension high and the audience on the edge of their seats when they should be. A most enjoyable film which I highly recommend. The hooks to the first film are few, so you don't really need to have seen it. The ones present are mostly about Alejandro's background, family and previous revenge - but it's not critical to the plot of this film. The missing Emily Blunt from the first film is in-part offset by the new teenager girl incoming, giving proceedings a leading female, though with an obviously different emphasis. How much of it is realistic, how things actually happen or bent truth, to some degree, for most people watching, won't really matter. Enjoy the romp! Mexican filmmaker Guillermo del Toro grew a reputation in the 1990's for making interesting, dark, sometimes gruesome but always creative and imaginative fantasy horror/thrillers. This 1993 film opened the door for him to a broader worldwide audience as he moved on to other opportunities like Mimic, The Devil's Backbone, Blade II, Hellboy, Pan's Labyrinth, recently The Shape of Water and to come, the real-life Pinocchio! He's been a busy chap! But it started here and I watched this back in the day but haven't seen it since. I decided to give it another go - with a view to working my way through some of the above-listed films, which I've missed along the way. I'm sure that I have missed a lot of deep symbolism here, but the story is an old one about the human lust for eternal life, an opportunity that arises to attain that for one, the chaos that invokes and price paid for getting involved. It's a stylish take on the tale of the vampire and I'm really not one who would usually go for that. Quite the opposite, but the horror here is not cheaply or shockingly executed - rather weaved into a story which engages the audience from the outset and is intriguing enough to ensure that nobody leaves their seat until the finale. We're initially in Mexico, four hundred years ago, and an alchemist makes a device which, when used properly, gives the user eternal life. Our central character is an antiques dealer and stumbles on the device 400 years later (so pretty much now current), then accidentally invokes it into action. When mechanically wound up it unleashes sharp feet which dig into the user and injects them with some sort of stuff! There's a rich and sick man, elsewhere but nearby, who 40 years previously stumbled on the handbook of instructions, penned in code and Latin by the alchemist, but couldn't find Cronos. And so a battle commences. The rich and sick man wants the device to make sure he doesn't die but our hero, who's now in the grip of the Cronos and becoming attracted to the acquisition of human blood, won't give it up. The rich man's nephew, played by Ron 'Hellboy' Perlman stands to gain the rich man's empire, which adds another twist as he is charged with doing his uncle's deeds - getting the Cronos at any cost, keeping the tension and drama high. The team of actors are the director's favourites and pop up in his films later on. Frederico Luppi plays our main character and Claudio Brook the challenger. Ron Perlman is the only one I knew, to be honest, and he's certainly one of those actors and faces that you will absolutely have seen somewhere along the way. They all perform their tasks convincingly enough and the leap between spoken English and subtitled Spanish is wild! In the same scene often, one person speaking in English, the other replying in Spanish. I'm sure I'm missing the point of that! The sets are dark always, and full of atmosphere. The horror is far from jump-out-your-skin stuff, rather intelligent and well paced. It's violent and bloody in parts, but that was to be expected, I think! 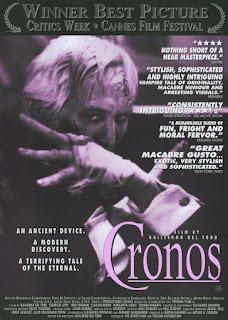 There's some excellent, thoughtful photography and I particularly liked the inside of shiny Cronos in close-up with gears and cogs, clearly showing that there was indeed a living creature of some sort inside (set up by a previous discussion about insects being able to live hundreds of years, left undisturbed). The music, at times, feels very dated (a bit like you'd expect in a 1980's episode of Colombo) but at other times lifts the tempo and adds to the style and atmosphere. It's an excellent film which I really enjoyed first time out at the cinema and again now. I had forgotten a lot about it and was able to enjoy some of the twists and turns again. 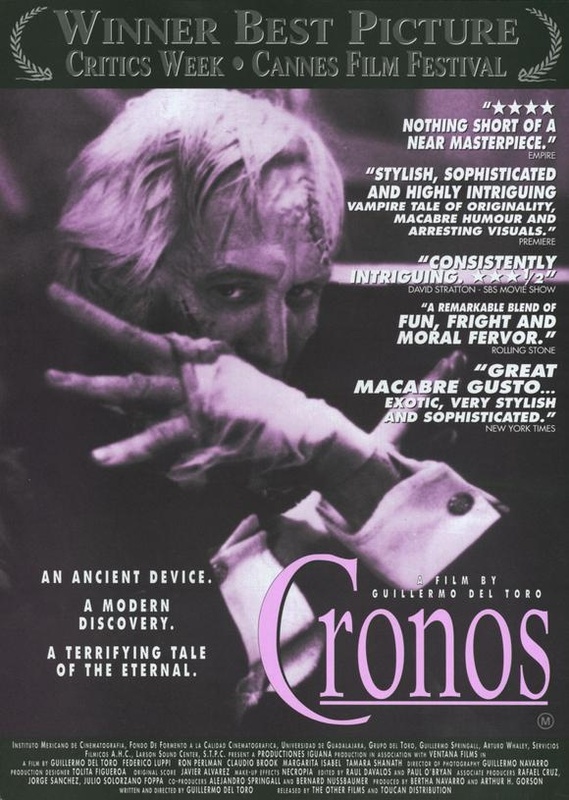 As I say, this really isn't my kind of genre, but I'm glad I re-visited this and will try again now with Pan's Labyrinth which I previously gave up on as daft. Maybe I'll see it with del Toro eyes this time! Recommended. 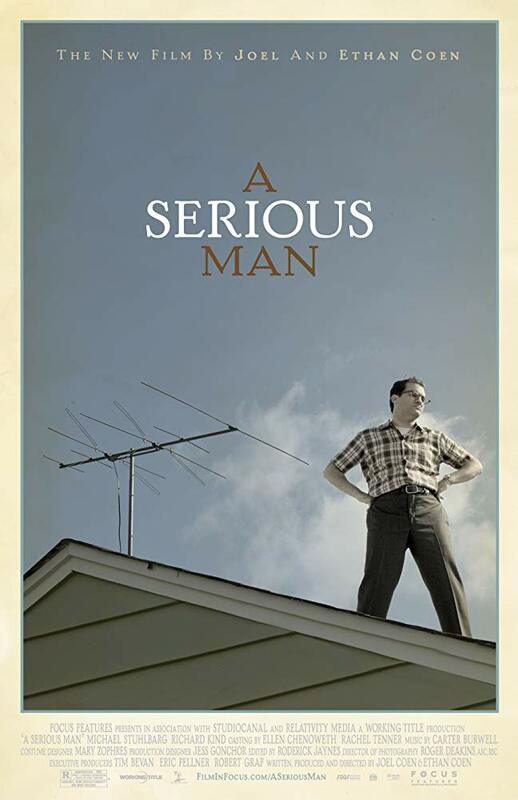 Attempting to work my way back through the Coen Brothers' films, I got to this 2009 one which is in many ways similar to Fargo but centred around Jews living in 1960's America and focuses in on the story of one man at the centre of a chaotic life amongst all the religious tradition (think Martin Freeman or William H Macy from Fargo's film and TV shows). We have lots of crossover actors too from all sorts of other Coen Brothers' projects (and plenty of Woody Allen's too), which makes it interesting to spot-the-link as we go along! Larry is A Serious Man who's played excellently by Michael Stuhlbarg (who also played Sy from Fargo Year 3 as Ewan McGregor's Emmit Stussy's accountant) and Larry's world is falling down around his ears. His wife is fed up with him, seeking a divorce and looking to set up a new life with her friend Sy (yes, another Sy), played by Fred Melamed who also popped up in Fargo, along with various Allen films. His son hangs out smoking pot most of the time, daughter is only interested in how she looks, stealing money from Larry for a nose-job and preening herself for boys! Then there's the scary next door neighbour (think American Beauty) looking like he'd punch his lights out given half a chance over property boundaries! Larry is a Professor in the local college who's seeking betterment and that likelihood is looming any minute so he has to hold it together. The son's bar-mitzvah is also coming - and what a scream that is when we get there and the son is high! Larry's loser brother is also living in the house with the family and Larry has to deal with him and his problems on an hourly basis and to add to his troubles, the wife is making him pay for the legal fees associated with the divorce and has forced him and his brother to go and live in a motel! Thrown into the mix is an attempted bribe for higher marks by an Asian student and his father, making Larry feel as though the threat of racist claims gives him no choice but to comply - and the money would be handy! Larry heads for the Rabbi to seek advice (a very funny turn from Simon Helberg, from The Big Bang Theory fame) and get's nothing but philosophy as the world closes further in on him. What's interesting and different about this film is that there's really not much meat to the story (unlike the Fargo where murder and mayhem surrounded the main character) and nothing much happens - and in that regard, it's much more like an Allen comedy. It's about people, their interactions and one man having to find a path through it all. In some ways it's lethargic, but in every scene there's also rich comedy and laugh out loud moments, tempered with just having to feel really sorry for the long-suffering Larry. There's deep meaning, no doubt in the film for those who don't want to take it at face value, philosophical and religious commentary about the meaning of life, the struggle for answers to impossible to answer questions, reflected for some on Larry's classroom chalkboard as he poses difficult mathematical formulae for his students to look to solve - along with a bizarre opening and apparently unrelated subtitled scene in which questions are asked about reality, existence and perception. There's much to get your teeth into if you want to delve beneath the surface, but it's also an entertaining tragicomedy which the viewer doesn't really have to know much about Judaism to enjoy. The film is, as you would expect, beautifully produced and directed with exacting detail from the brothers who can, it seems, make films now just as they want to now instead of pandering to money-making in the industry. And it shows - the amount of time and effort spent on sets and camerawork are an education, regardless of the content of the film, story, script or dark humour. The cast, as I said earlier, are exceptional, each and every one - and it's great fun spotting people from other films and TV as you go along. I'm enjoying my path through the films of the Coen Brothers very much and the further I travel along it, the more I appreciate that these filmmakers are some of the creative geniuses of our time. Highly recommended - as are most of their films. 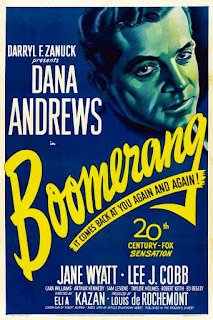 I would never have thought to watch this film from 1947 if it had not been suggested that I do so by my dad. It was one of Great Uncle Ted's favourites and dad tells me that Ted took him as a lad to the cinema in post-WWII Southampton for repeated viewings as Ted loved it so much! So I thought I'd give it a go. The story is a true one, or based on fact, about a popular priest in Connecticut who is shot in the street one dark night, the failure of the local police to catch anyone for it, the subsequent framing of a drifter who nobody cared much about, the potential political impact on some of the local businessmen and officials in City Hall and the moral standpoint taken by the city's DA in order to see right prevail. The priest was very popular and when nobody was being apprehended for the crime, the authorities came under much pressure from, particularly, the press who were out to get headlines at any cost. The public were up in arms and demanding, almost to the extent of mob rule and/or violence, that something had to be done. The rising pressure on the man leading the police investigation also had an impact on how he behaved and executed his duties. So a real pressure cooker boiling up and only the DA standing between the accused and a rope. 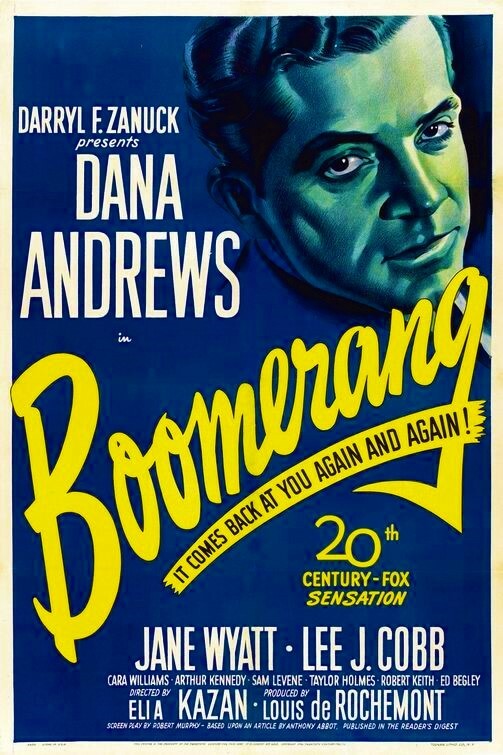 Now, I'm too young to really know most of these actors, but Dana (isn't that a girl's name?) Andrews takes the lead as the DA and is clearly the most capable and natural actor on display here. He's a handsome chap who I realise now was the heart attack suffering pilot in Airport 75, decades later - and has a list of cinematic triumph aplenty from 1940 onwards! He's married to Madge, played by the very pretty Jane Wyatt in a time when men made sure that women knew what society expected of them (though Madge, in this case, has a surprise of her own too)! A time when women leave the room when men come in to let them do business, which, by inference, would be above their heads. A time when they were expected to serve food and drinks to the assembled men and even put up with overt rudeness. On one occasion a man enters the room where man and wife are sitting, to which the man exclaims delight saying "...I needed some company" and the woman is shuffled out of the way, as if hers was not good enough. This is an interesting snapshot of post-WWII America though, where everybody, but everybody is smoking (on one occasion next to a petrol pump and even in a court of law) - and boozing half the day too! Every scene seemed to involve breaking out a bottle and glasses - alcohol left right and centre! Also a time when young people were well behaved, well groomed, polite and neatly dressed - and everyone wore black or dark colours, all men dressed the same - and wore hats! In keeping with this, the film was shot in 4:3 and black and white, in a near noir style with long and deep shadows, uplighting, shallow depth of field, close ups and soft focus. Think Casablanca. Hoards of men swimming around police offices, run by Irish migrators, paint the picture and style of the 1940's sets and style. It was directed by Elia Kazan, famous for various other projects such as A Streetcar Named Desire, East of Eden and On The Waterfront. The story unfolds in a near-Hitchcockian way as twists to the story come along and turns are presented to the audience without prior exposure. I wouldn't exactly call it a thriller, but the style of delivery is clearly an attempt to make it so and thrill the audience with what material the filmmakers could, given that it was true - and presumably most people would have known the outcome. In that sense, it probably works better decades later for the likes of me, who didn't! Hang on - I recognise an actor here. It's Karl Malden who plays one of the policemen, though not a lead role. He's the one with the nose! One of those actors that you'll have seen all over the place but probably don't know his name. I remembered him from Beyond the Poseidon Adventure, The Streets of San Francisco and Patton in the end! I expect people older than me will of course connect more with the actors here. It's an enjoyable watch, which doesn't feel like it's a boring old film in black and white. It's very well made and on the whole, solidly acted. It's paced nicely and there's no room for getting bored or making a cuppa during the proceedings. Films always seem to have a special edge when the viewer knows that the story is true, and this is no exception. It's not so easy to get hold of, but if you see it somewhere being shown one afternoon on one of the film channels, set your recorder. You won't be disappointed. Disappointed as I was to hear the rumours about Razer abandoning their Mobile Division and the cancellation of the Razer 3 along with Project Linda, I was re-encouraged to then read that this may not be quite so. We should have learnt by now not to listen too much to rumours! A statement from Razer suggests, though not too specifically, ongoing commitment after all. 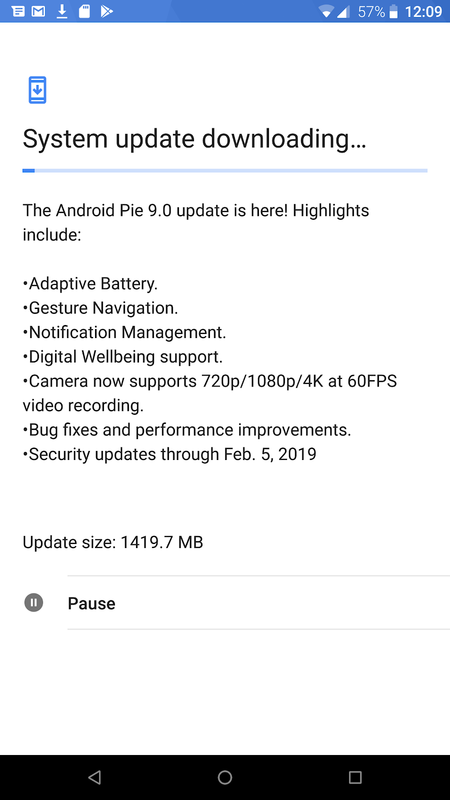 Furthermore, I'd lost heart in the apparent abandonment of the OG Razer Phone in terms of Security Updates and a long-awaited shift to the Android 9 (Pie) software - so much so that I'd stopped using it except as a media server. My flawed logic and feeling was about who'd want to invest their enthusiasm and time in a system that they know is heading down a short cul-de-sac. However, nothing lasts forever - and something which one of the PSC Group members said, made me take stock of that. Whatever phone (or other piece of tech) we buy, it won't now have a long life. Gone are the days when we can buy any tech and expect ongoing support for decades. So, the message I digested was to get on and enjoy using it - the phone with the best speakers on the planet - and stop fretting about the future! In my original review of the loan Razer Phone OG, I was wow'd by the amazing sound coming from the speakers, six months later I was back with longer term views, having by then bought my own, from then until now I have compared the sound output to many other phones including this Samsung example and finally, I bought and reviewed my own Razer Phone 2 to see if and how that improved on the already fabulous USP. I remained disappointed by the lack of updates from Razer and ultimately returned the unit (as the improvements were significant - but not £700 significant!) amidst rumours, as I said above, of abandonment - as it was an expensive acquisition. However, it seems that Razer got their finger out, responded to the Razer Community's pressure and pushed out an update, just last month, giving the Razer Phone 2 a delicious slice of Pie. I had previously considered that, as I already had the OG Razer and there's was no sight of Pie in either, the 10-15% improvements in speakers in the second generation wasn't enough to be throwing away more flagship money. The other significant event which swayed my decision was that the new price of the Razer 2 had been dropped from £779 to £499 (thus initially at least fuelling the rumours of a Razer bail-out). Time to think again! As you can see from the screenshot above, as soon as I turned on this SIM Free unit, which arrived with 8.1 and October 2018 Security, it was looking to download Pie and February 2019 Security, followed by a second download attending to Audio fixes and improvements, latest GMS apps and other fixes and improvements, unspecified. Very encouraging! The usual array of Pie changes are listed there along with 4K video recording at 60fps in the Camera app. One of the huge benefits of working with Nova Prime, particularly when it's baked-in here (which means there's no need for the side-loading of the Nova Companion app to get Google Feed, or Discovery, or Assistant Cards - or whatever it's called this month) is that a simple BackUp from the old device to Google Drive (for example, though could be anywhere you fancy) and Restore to the new, means that you're up and running as swiftly as, well, a swift! To the changes, then - and there ain't that many really - but I do feel better! There's obviously all the Pie goodness in terms of the Settings being rearranged and more colourful, some stuff shifted from one menu to another, or from sub-menu to menu - and the round big buttons in the Notification drop-down (though this time they're Razer Green/grey instead of iOS Blue/grey) - but we've seen all this many times now. Navigation control on the homescreen is a Pixel Pill and (non-context sensitive, ever-present) Back arrow (which we believe will be going away in Android Q anyway). Interesting that they've done the same thing here as I found in one or two other manufacturers' Pie implementations, differently to Google's Pixel devices. The Pill control also work slightly differently in that with Pixel you have that one up-swipe from it to get to Recents and a staggered up-swipe to get to the Apps Tray, but here, and better I think, it's a swipe-up from the Pill for Recents the same, but rather swipe from the 'dock' area for the Apps Drawer. Works well and there's no finger gymnastics to learn for users. You can also, should you wish, unlike with a Pixel, switch back to Home, Back and Recents buttons. Whichever way you have it, the screen space is taken up with them (except for in media-centric apps like YouTube) so there's no clever OnePlus/Samsung full gesture control available as an option. Call me an old fart, but I think I actually prefer the old way - certainly until everyone catches up with the much better Motorola execution of The Long Pill. Adaptive battery and brightness are present along with Digital Wellbeing, for those who still love their Nanny. There's the aforementioned 60fps 4K video recording for those who might make use of it and the important point here is that all this is straight-from-Google stuff, not tweaked and messed with by phone manufacturers wishing to put their stamp on it and (allegedly) making it better. There's something pure about the way in which Razer works with Nova who works with Google, keeping what's on the phone as clean as a whistle - whilst still enabling terrific customisation options in the launcher's settings. The Chroma thing on the back works just like it did before, enabling control of the lighting of the big Razer LED logo. By far the most sensible option for this is of course using it for incoming notifications but otherwise off. But each to their own! Those who do cane it can, of course now, use Qi Charging for top-ups. Strangely, the Dolby Atmos in the Razer Phone 2 (since Pie) has had a couple of main options taken out - Voice and Game. I have no idea what that is about, nor seen it referred to anywhere, but it really doesn't detract from the vast array of options, buttons, bells and whistles available to tweak sound until the users' hearts are content - making the system-wide sound options second to none. One of the most enjoyable things I've found whilst using the system is not blaring rock music out at maximum volume, but rather turning it down and then playing with the rich options available in a quiet room. This is not just about raw volume - there's such of a lot of other ways to enjoy great sound! So there's not much more to report really. I still maintain that the speakers are louder and richer than the OG Razer to the tune of about 15% - and that the Razer Phone 2, armed with Dolby Atmos is the best sounding phone one can buy. I've still yet to hear Asus' ROG phone output, though we did cover that on a PSC show a few weeks ago with Adrian Brain, who was able to at least put that up against the OG Razer Phone. Results of that can be heard in Phones Show Chat 485. There's no black and white statement from Razer about the future of their Mobile Division. This phone could, very well still be a niche device and Razer might stop supporting it as we go through the 2019 months. And yes, I might well then end up whining about being let down again - but I'll really try not to! Even Android phones with previous generation versions of the OS - and a security version a year old - are still perfectly usable. The challenge might be, should that happen, an acquired adjustment of mindset, owning the risk of that happening right now. The price now, for the amazing hardware on show is very reasonable, and not only for the speakers. I shall hope for support going forward, but revisit these words in the months to come if I'm feeling disheartened! The Motorola One is an attempt by the firm to bring an Android One device to market, with all the benefits of regular updates and clean Vanilla that brings along with the Moto signature. It started off in asia as the P30 Play, smaller brother of the better specified Motorola One Power or P30 Note. The China version had a different front-end for that market. Hope you're keeping up at the back! When it got to the UK as the One last year, it was released at £269 but is now available at just £199. That's a congested place in the market, but not when you consider only devices as close to Vanilla as this one. If you can see past those claiming that it's a clear iPhone clone with Apple design language (after all, everyone's doing that), I think they've done pretty well here. But let's get that one out of the way. Yes, it does look kind of like an iPhone of the day, with the general shape and positioning of the camera islands on the back, but unlike the real clones produced by the likes of Honor, Xiaomi et al, that's where it ends. Where some others also infiltrate the system and settings with iOS-style options, colours and buttons, Motorola here certainly does not - beyond those adopted by Google for Pie. This handset reflects a mixed parentage of Motorola and Pixel - and actually looks very much like a Pixel. It has the general shape of the smaller of the Pixels, but with one big difference - the screen is usefully that much bigger. I've always said that the Pixel devices have been small one, too small, big one, too big - and this unit sits right in the middle - in the same way as various Nokia devices. The Goldilocks Zone. First to the physical, for 'tis where we usually start, and we find a device made mostly of plastics - hard and tough-looking plastics, which doesn't seem to detract from the robust feel of the device. It oddly feels like it's glass in the hand because of the look of the back, which has been carefully covered with a layer of clear plastic on top which is very reflective and glass-looking! (Very much like the front covering of the keys on the Nokia 6680 family - remember those!) Added to which, I have the black version here, this adds to the 'more classy than price reflects' look and feel. Those who have said that it feels less that great because of plastics seem to have been handling the white version. There's the word 'Motorola' on the chin on the front, which is slim and would have acted with symmetry taking in the forehead, if there was no notch and ears - we'll come to that. Bezels left and right are 'just right' - balancing minimalism with enough space to avoid accidental touches. There's an earpiece speaker in the forehead with a Selfie camera and sensors but no Notification LED. On the right is a volume rocker and power button, plastic again, but feeling plenty sturdy enough. On the top is a 3.5mm audio-out socket, left side SIM/microSD Tray and bottom, USB-C port and two grilles - one of which is a mono speaker. Lastly to the back and a circular fingerprint scanner with a Moto M in it, just in the right place 75% of the way up in the middle. This works perfectly well, registration is short and sweet and it works blazingly fast every time. The One feels very much like the size and weight of a Pixel 3, but when you put them side-by-side you realise that the Motorola is significantly bigger - but it feels like it's all screen in comparison - though of course the chin of the Pixel has to house one of the two faux stereo front-firing speakers. Motorola claim that the device is splashproof, but there's no IP rating - much like the rest of their current range of devices. In the (strangely oversized) box you get (in usual Motorola style these days) a thin and floppy TPU, which is perfectly usable and grippy but many will want a better quality one. There's also a USB-A to USB-C charging/data cable, a 15W TurboPower charging plug and the usual papers and SIM Tray ejector tool. The front glass is protected by Gorilla Glass 3, which makes it better for protection from micro-scratches but not so protective against shattering. I'll take that payoff, having recently marked a GG5 screen. It's an LTPS IPS LCD screen underneath, 5.9" in a 19:9 ratio, making it tall and narrow compared to 16:9. There's a very wide notch at the top. There are sensors, speaker and a camera taking up that space, but you really get the feeling that it could easily have been smaller - or at least that in software there was the option to hide the ears and bring the Notifications down more (but I suppose that's not the Google Way). There's hardly any room for Notifications and I constantly have a Dot on both sides telling me that there's more to see. The panel is a 720p one and on the face of it, you'd think that's a big problem - and it might be for those with younger eyes or people who want to use the device for specific graphical purposes, but actually it's just fine. The colours are reproduced very nicely and can be switched between Standard and Vibrant in Settings with a warm/cool slider for fine tuning. Text in web pages looks absolutely fine to my eyes, clear enough and I see no edge issues with characters. Why we need 1440p screens, I don't know. 287ppi in my world is perfectly usable. Putting this LCD screen up against (what is still, I think, best in class) the Nokia 8, both on 100% brightness, yes the Nokia is brighter, but that only really rears its head in practice when out in bright sunshine. Watch out if you live in Libya, or somewhere else with sun! Actually we do have the sun out here today and the screen remains perfectly usable in bright direct sun, if not quite so good as the Nokia. This Motorola One was bought from Argos in the UK and is Dual SIM out of the box, so I can only assume that this is true across the board, but worth checking if you need that and you're in a different region. The two slots can both be used for non-data but you have to choose which of the two will work with data. The good news is that the microSD Card slot is available as well as the two SIM slots. Talking of which, I have tested my 512GB microSD card here and there's no problem reading/writing from that and the phone didn't want to format it first. The USB OTG also works perfectly, plugging in this big card - and the system sees it and uses it as an extSSD. Kudos! Incidentally, testing of the cellular and wifi aerials returned excellent connectivity as we'd expect from Motorola. 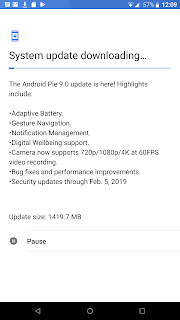 On release, the phone was running Oreo but in keeping with the spirit of Android One, was soon updated to Pie and this unit now has February 2019 Google Security on board. I feel confident going forward that this will be kept on schedule in the same way as Nokia is doing, but not the other (non Android One) Motorola devices, which seem to lag behind somewhat. Another price-point decision taken with this phone was to equip it with a Snapdragon 625. Let's be clear here - this is no Snapdragon 400-series underpowered device. The Moto Z3 Play is working perfectly well with a SD636, behaving mostly like a flagship device with an 800-series chipset, and this 625 really doesn't feel much different. I honestly don't feel any delay in any processes running anything which I would normally ask of a phone. No doubt a heavy gamer this would not suit, but for most of the rest of us, I think it's just fine. Not to mention the power benefits. Strangely, the only single thing I noticed the device being slow to do, was to power-off. Compared to other Android One devices, maybe that is indeed a chipset thing. There's 64GB of on board memory here and, unlike the Pixel, a microSD Card slot, as I mentioned, so plenty of space for media and storage alongside hundreds of apps and their associated data. Yes, I'd much rather have 128GB but with USB OTG and 64GB, I can manage! Same as the Pixel, this has 4GB RAM and, again, I see no problem with this. Switching between tasks is just fine and I have had many, many apps open which the system (at least through aggressive RAM management) is not closing down. The battery supplied in this phone is a 3000mAh one, which, on the face of it, is pretty mean, but with the SD625, less RAM, 720p screen all working together with the efficiencies of Android Pie, the return on daily use with this battery is really super. It's getting way past one day, mostly through the second. As always, it depends what you're doing with the phone - how demanding you're being, which means that I can only go on my average use. Like the Nokia 8 Sirocco, the battery capacity seems to be disproportionate for what I'm getting out of it in terms of longevity. I now come to my favourite topic, sound! There's a single mono loudspeaker here which although is no Razer in terms of volume or quality, Motorola has supplied what they're calling Dolby Audio controls. Now, this is an interesting topic as it's not the Dolby Atmos as supplied with the Razer Phone, nor is it the apparently stripped down version found in the likes of the Moto G7 Plus or high-end Samsung devices of late. The version in the Razer seems to have the most controls and options, this version here second with a similar layout but not quite so many and the latter, Samsung/Moto (for example) having some very basic on/off switches and three pre-sets. Apparently, it's all to do with the audio decoder and what that is capable of processing (2.1, 5.1) - and from there, the software supplied to control it. I shall have to learn more about all that but for now, this device has Dolby Audio, but with many more options available - more like an Atmos implementation. In practice, the speaker of the Motorola One with Dolby turned off, is still pretty loud and a fair quality. Much better than you'd expect for a unit of this size and price. Motorola still seem to ensure that they supply phones with better components than many others, even when cutting costs generally to hit a price-point. Turn on the Dolby Audio and the sound can be changed, tweaked and manually altered to improve and adjust high, mid and low end depending on the kind of music being listened to. Much like with the Razer, the options are near-limitless and really do make a good speaker into an excellent sounding device. There's no stereo of course, but if you need that there's a traditional headphone socket! Turning to headphones, then, and doing my usual test with firstly music and my AKG K701 reference 'phones. The sound produced is pretty low volume and flat without Dolby. There's no extra amplification going on here or fancy DAC stuff, but, like with the speaker, the use of Dolby makes a huge difference and allows for all sorts of enhancements to the sound. Again, near-limitless control and options. Now, plugging in my Razer DAC dongle (into the USB-C socket instead of using the 3.5mm) the volume and quality is transformed, as we might expect. Furthermore, the employment then of the Dolby Audio settings make a supporting hardware combination working with the phone's software, produce an amazing sound. But maybe that's true of any old phone! You probably have worked out by now that I'm no physicist, nor audio specialist so I dabble around the edges of understanding all this stuff, focusing much more on the experience, reporting what I hear and how it sounds. What sounds poor to my ears and what's great. Testing 5.1 audio via YouTube now - and I can, once again, hear helicopters coming over my head sounding like they're from behind me, as if sitting in a room full of speakers and Surround experience. I'm sure it's all tricks, but it sounds just fabulous. So - long and short is that the speaker is very good. Punches well above its weight. It's no Razer, nor bluetooth speaker, but is much more than adequate. Put on some headphones and things sound great with Dolby to help. Add a DAC dongle in the mix and immerse yourself! Things seem simpler when Bluetooth headphones are used - all the above goodness with no dongles or DACs or cables, of course. It seems that there's no aptX support here but even without, it still sounds fabulous, though that, I suppose, would only be tested with bigger and better kbps audio files anyway. I'll leave all that to the experts! FM Radio is also amazingly included, just like with various other Motorola handsets - kudos to them for continuing to support his - and here it's the recording version which can also be used via the speakers, again with system-wide Dolby Audio support for tweaking sound. What's not to like! The supplied cameras will win no awards but are are perfectly functional used in tandem with Motorola's camera app. It looks and feels very much like the app present on the Moto G7 Plus, Z3 Play and others. It has a sprinkling of bells and whistles but draws the line before adding options for kids and teens playing with daft effects. Feels much more adult! There's clearly no OIS at this price-point and options with 4K are limited to 30fps, but what you expect for under £200 with a SD625! The main lens is a 13MP f2 unit, Google Lens is baked in - and Portrait Mode works pleasingly well with the secondary 2MP f2.4 depth sensor and a slider for live appraisal. Close focus in Manual mode Macro gets a reasonable shot at about 3 inches. It's a perfectly good camera for the masses of people using the phone for social media purposes. Pixel Peepers - away! Now to the UX and near-Vanilla Pie experience. This is where it gets spookily similar to the Pixel and Essential Phone again with homescreen elements laid out just the same way but with, as I said earlier, more space via the larger panel. The fixed elements are present top and bottom, At a Glance and Search tube, right-swipe for Google Feed baked in, swipe-up from Home for Recents cards and longer swipe for Apps Drawer. The Pie-style Notifications drop-down with the bog-standard editing and colour scheme is employed. Settings too, mostly as stock as you can get. No Motorola adjustments anywhere in sight. In order to find the Moto stuff, you need to launch the Moto App within which you get access to some of the Moto Actions, Security and Display controls, but not all. The Voice stuff is missing completely, this being a stock experience mostly. Sadly missing is the one aspect which raises Motorola devices above most others - the Approach in Display. Instead of this, and replacing it, is a very similar scheme to the one most Nokia devices on Pie have adopted - in that you have to nudge or lift the device to fire up screen information. Immediately a Notification comes in, you do get some control over how to use that information and execute quick-interactions (to a degree), but only that first time. If the screen goes off again, that's it - chance gone. The much more interactive version of all this is available in the other Moto phones, but they've obviously decided to keep it very Vanilla here, as adopted by Nokia. Shame. The bottom line is that there's an awful lot of phone here, particularly for the Android purist for £199. It's clean, very Pixel-like with great battery and sound options. It's cute and neat - certainly pocket-friendly, has a perfectly adequate camera for the vast majority and defies the mid-range chipset through efficiency, performance and longevity. Yes, the phone is made of plastic but let's face it - you're going to have a TPU on it anyway - and plastic makes it lighter than it could be with all metal and glass. The main attraction for me is the purity of Android One and the fruit of the growth of the scheme. 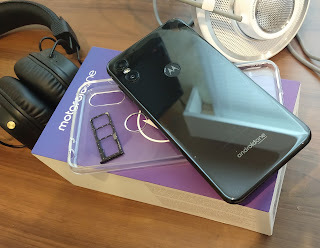 The Motorola One is a perfectly good option for anyone looking for the simple approach with some Moto goodness thrown in. Motorola are going great guns and I for one, armed with £199 would much, much rather have this clean and great sounding experience over any one of the upcoming Chinese firms' offerings. Highly recommended.